Think about the toys that toddlers and kids are playing with today. Think about the things that interest and excite them. How many of these toys, book, ideas and topics were relevant and exciting 25 years ago? Nowadays, more than ever before, advancements in all areas mean children are playing with toys and reading books that we wouldn’t have dreamed about 25 years ago. So what is there to bridge the gap? What did we enjoy as children that your kids can enjoy too? The answer is simple. Classic children’s books. Today, ArtScroll is celebrating the 25 year anniversary of the publication of one of our most beloved children’s books, Alef to Tav. 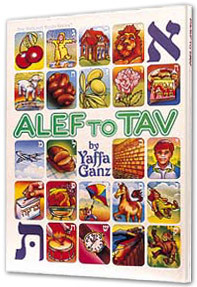 Alef to Tav by Yaffa Ganz was published in February of 1989. Twenty five years later, Jewish children from all over the world are still learning the Hebrew alphabet by reading the book and enjoying the clever illustrations within. Take a look at the cover. You’ll probably feel the nostalgia. I grew up with this book – you probably did to. Over 50,000 copies of this classic have been sold in the 25 years since publication. That’s a lot of little Jewish children, poring over the pages, learning to spot the letters, learning what sounds the letters make, learning Hebrew words and the letters that spell them. The ideas in the book are simple. Present the letter. Present some words that start with said letter. Show the reader a sentence that uses the letter. But the idea is profound. It makes the children really learn to appreciate the alef bais, the sounds the letters make, and the language of the Torah. If you have a child, a grandchild, a niece or nephew, give them the classic gift of the Hebrew Alphabet. Click here to shop children’s classics from ArtScroll.